The Canon EOS Rebel T7 combines fantastic features with easy-to-use operation for high-quality images you'll be proud to share. Harness the power of the large 24.1 MP CMOS sensor to realize your potential for great shots. Built-in Wi-Fi and NFC connectivity make it easy to get your favorite pictures up on social media sites. Additional features: 9-point AF system; continuous shooting up to 3.0 fps; Full HD 1080p video; Scene Intelligent Auto mode; 3.0" LCD screen; optical viewfinder; remote shooting; on-board feature guide; creative filters; plus more! 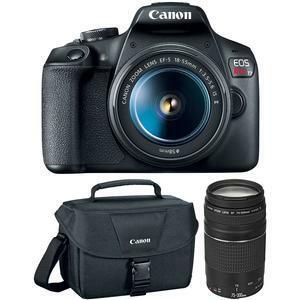 This T7 bundle comes with the EF-S 18-55mm f/3.5-5.6 IS II Lens, EF 75-300mm f/4-5.6 III Zoom Lens, and 200ES Digital SLR Camera Case.